The case against two high-profile Sinn Fein activists accused of IRA membership collapsed this week after key witnesses withdrew their evidence in a dramatic week for republicans in the court. 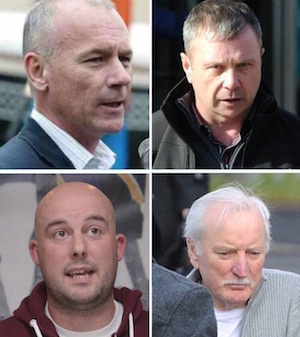 On Wednesday, Crown prosecutors offered no evidence against Sean Hughes (top right) and Padraic Wilson (top left). The judge then acquitted both. In a statement released after the hearing, the prosecutors said principal witnesses had withdrawn their evidence. The case centred on an alleged internal IRA investigation after the stabbing of east Belfast man Robert McCartney in January 2005. The two men were accused of IRA membership and addressing meetings to encourage support for the IRA -- but the judge directed they be acquitted as the prosecution had failed to offer any evidence. A spokeswoman for prosecutors later said during a series of meetings one witness “expressed concerns in relation to a decision not to prosecute in a related case and also the selection of charges in this case”. Mr Wilson was the most senior IRA figure in Long Kesh prison at the time the Good Friday Agrement was negotiated in 1998. Sinn Fein has campaigned on behalf of the men and against what they described as “political policing” by the PSNI. DUP Assembly member Edwin Poots claimed unionists were losing confidence in the “bungling” prosecution service. “People are rightly concerned that the PPS can so consistently fail to deliver. What confidence can anyone have in this organisation? Where is the leadership?” he said. But there was dismay this week when prosecutors said they wanted to bring elderly republican figure Ivor Bell (bottom right) to trial for “aiding and abetting” the execution of informer Jean McConville in 1972. The case revolved around the Belfast Project, an oral history project conducted by Boston College of former IRA Volunteers and loyalist paramilitaries. After a number of court extensions to consider the evidence, Crown prosecutors had been given a final deadline of yesterday to indicate its intention. A judge in the case had been about to throw the case out when the decision to prosecute was announced. The prosecution lawyer then claimed six more weeks was needed before they would be in a position to set a date for trial, due to the need for “extensive preparatory work”. Lawyer Peter Corrigan, acting for the 78-year-old Mr Bell, questioned the timeframe. He said the charge was of a historic nature and his client, who has failing health, had already waited 14 months since he was charged. “In those circumstances, bearing in mind his age and his health issues, he’s entitled to a speedy trial,” he said. US commentator Chris Bray described the complete lack of evidence as Kafka-esque and said the death of Jean McConville had become a can “to be kicked endlessly down a road”. “If ‘extensive preparatory work’ is required, what they have been doing for the last fourteen months?” he wrote. There was better news for interned republican activist Dee Fennell (bottom left), who was released from Maghaberry on bail this week, although banned from “any public speaking”. A judge decided the 33-year-old, who has a young family, could be released from custody after he pledged to abide by all terms, including an order not to post any material online. Mr Fennell is a spokesman for the Greater Ardoyne Residents Collective which opposes sectarian Orange Order marches through his neighbourhood. He was accused of “encouraging terrorism” following an Easter commemorative event in Lurgan, County Armagh in April. His arrest and detention without charge had become the focus of a civil rights campaign. Aileen Smyth, defending, pointed out that Mr Fennell was simply asserting his own personal opinion, “At no point was he indicating he would encourage anybody to engage in any acts of violence,” she said.